The following is a guest post from reader Thomas Howard. All photos are copyright © 2014 Thomas Howard. If you have a hammock camping trip report you’d like to share, please submit it to theultimatehang@gmail.com. Black Diamond elliptical shock poles. 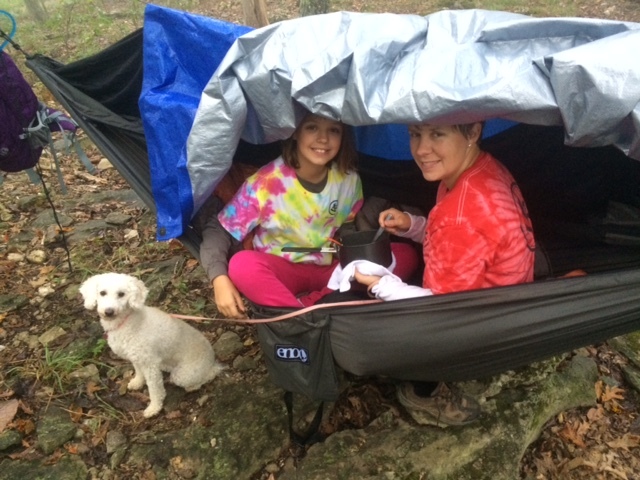 Had a great time with Wife and 10-year-old daughter with our miniature poodle on our first night hike at 50°F (10°C). After a challenging week at work, I called my wife late Friday and said, “I need to get to the woods.” She said, “Pack the car”—so I picked up some bear spray on the way home, packed our gear and some food, and we were off (on a 5-hour drive) as soon as my daughter got out of school. Arrived at the trailhead around 10:30 PM and hiked an easy 3 mi (5 km) downhill to a large clearing I recalled from my day hiking experiences. When setting light protocol we quickly realized my wife and daughter had red spotlights that rendered my subtle Black Diamond red light unusable. 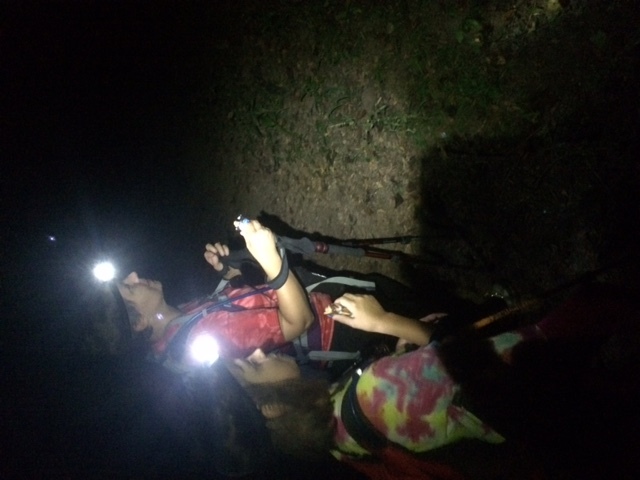 In the first 20 yards (18 m) we had to eliminate fear and identify all of the hard charging noises (crickets, big and little frogs, owls, bats, hard charging squirrels, etc…). Then we decided to use white lights. My wife and daughter’s spot lights were good for about 15 ft (4.5 m). Mine was variable and allowed us to spotlight about 70 yards (64 m). We spaced out about 10 ft (3 m) between us and my wife took lead, followed by my daughter since I’m big and tall and she and my daughter are little. I used my spot light to light the way in addition to their little lights. I didn’t argue—they cleared the spider webs. My wife wouldn’t give up the lead. They don’t like to be behind me. I block the views. We stopped several times to snack and to star gaze. Once we heard aloud thrashing and spotlighted a giant doe 20 yards (18 m) a away. We must have spooked her with our laughter. Another time the spacing between my wife and daughter grew to about 30 ft (9 m). My daughter started using a different side of the trail and stopped cold with a 2.5 ft (76 cm) copperhead in front of her perpendicular to the trail. We spotlighted it and it raised its head turned 180-degrees and went back into the bush. The fog was heavy. Very heavy. When we made camp, I did not put up tarps. 15 minutes after getting into sleep position, my daughter who was stacked above me said, “Dad, am I supposed to be getting wet from the “not-rain?” Heavy drops of dew were falling from the trees. So I put up the tarps and we all slept great. My wife and daughter are both interested in getting better at setting up their own gear now. We plan to work on cross training to speed camp set-up this week. We’re taking some friends on their first hike next week. 30 hours later were home, rested, and relaxed. What a great trip report!!! I’m challenged now to go on a NIGHT hike and hang!!! I think I’ll test out the adventures with my boys first before dragging my wife and daughter into a night hike.. You know.. Flush out some of the bugs! And what river is that behind you in the photo???!! Love it!!! Great report. We live in KC and try to get to the Buffalo River several times a year (3 times this fall already). Had the same experience with the non-rain wetness. What part of the trail did you do? 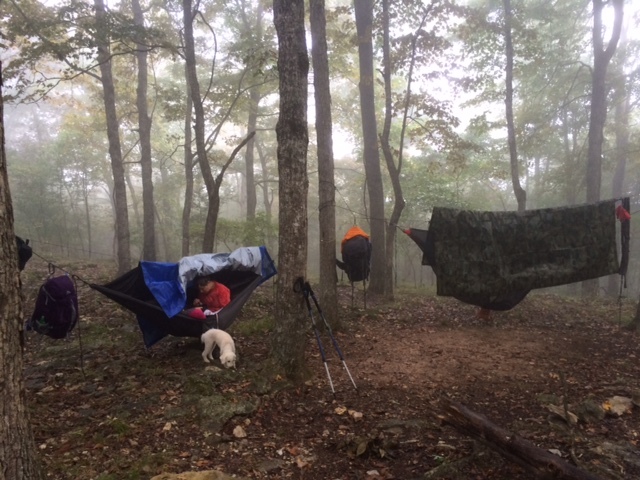 We hiked the Centerpoint trail to Big Bluff and camped at the Big Bluff Spur. 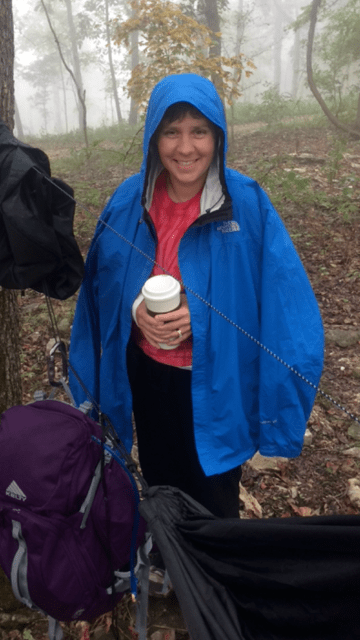 Sometimes I continue down the hill about another steep mile to Jim Bluff, drop our packs, and pick up the Buffalo River Trail (BRT) to Hemmed in Hollow to see the tallest waterfall between the Rockies and the Appalachians. When the water is low, the fall looks like someone is squirting a water hose off the top. I wish I had some good answers for both of you, but I’ll have to wait for the author to reply. Excellent trip report. Great family adventure. I like the concept of stacking the hammocks. I assume you hang your daughter’s hammock a little high and help her in and out, and hang yours below. Brilliant concept, probably giving her some added security being closer to Dad. How well does the little doggy do in the hammock? I have a 50 pound dog, so sleeping with her would not be possible. I have the GT also and love it. My daughter loves knowing I am there (“to fall on” or “get eaten first”)..lol…I like my hammock anchors to be 12 to15 ft apart, so I usually hang my daughters hammock webbing at about 8.5ft or as high as I can reach. She lays about 5ft off the ground. My Hammock, under her, with me in it usually ends up about 3 to 6 inches off the ground. The tarp slung over her ridgeline traps some of our heat. We have used this configuration on all of our hammock camps and she has only started to get a chill when the temp reaches close to 25 F.
The dog (~12 lbs) does great and usually sleeps with my wife. The dog “Peaches” is only two years old and gets plenty of exercise at home. Needless to say Peaches always sleeps well after an adventure in the car on the way home. A lovely story Derek – sometimes the short camps are the most memorable. Anything that pulls us out of our daily routines is perfect! My good friend and hiking partner Nathan took the photo on one of our family hikes early this year. 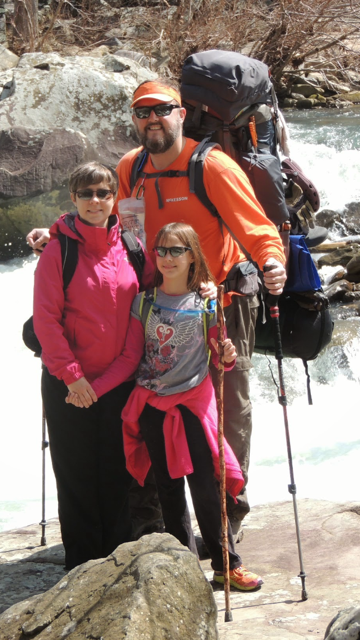 Usually after we have hiked an area and understand the risks and terrain, we do a follow up hike with our family. Great Report! I like the night hiking concept. Much like winter camping, that gets a person out of their comfort zone. Makes them think and use their senses more. Also helps folks to realize that the night isn’t necessarily scary, except for snakes!